Lydia Wade hosts The Homemaker With Lydia, a program series about what builds a home. 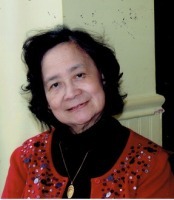 Host Lydia Wade has a Master’s Degree in Home Economics from the university in Manila in the Philippines. She taught Home Economic for thirteen years in Manila before she was recruited as a Contract Education Officer by the Nigerian Government where she worked for nine years as the head of the Home Economics Department at Federal College of Education in Abeokuta, Ogun State, Nigeria. She received Nigeria’s prestigious award as one of the seven outstanding contract workers in that West African country. She also worked for eighteen years in Queens, New York as a Benefits Entitlement Specialist, Case Manager and Lecturer on Food and Nutrition at four “Senior Centers. This program was funded by the Department for the Aging. Since retiring she has traveled extensively and has written five published books. In her new program “Homemaking with Lydia” she will share her knowledge and experiences on current food trends, nutrition and health, family relationships and related issues which directly affect a family’s well-being and welfare. Click on the “Shows” button in the right column of this page to view the “Homemaking With Lydia” broadcast schedule. Listen Below to Previous Broadcasts of The Homemaker With Lydia that interest you.